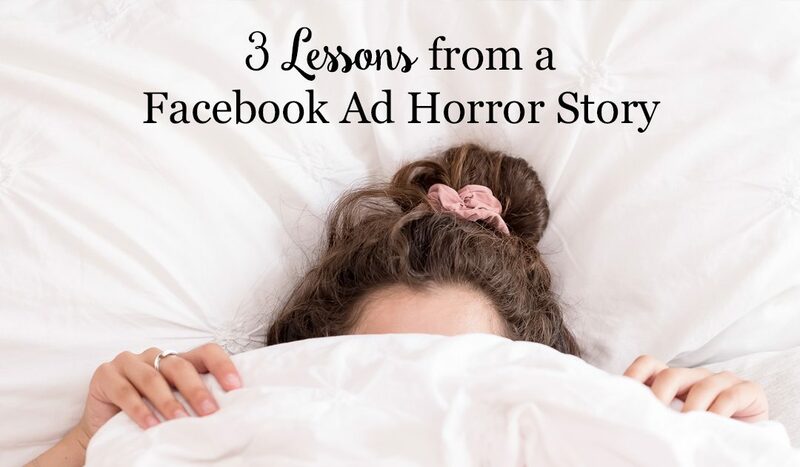 The other day, social media strategist extrordinaire, Veronica Amarante and I chatted about some Facebook Ad Horror Stories and the lessons from them, and it was juicy! But if you prefer reading to watching videos (like I do), read on, cause it’s story time! As a Facebook Ads Manager, I regularly hear about Facebook Ad failures from potential clients. Today I want to share one of the worst ones that just made my heart hurt for her. Let me tell about Becky (*not her real name). When Becky came to me she had poured a couple thousand into running Facebook ads. She had even hired someone who said they knew what they were doing. She has an awesome business with amazing life-changing offerings, but she needed to get some leads into her business and the money she’d previously spent on Facebook Ads had resulted in none. As soon as she showed me her ad account, I immediately knew why. It’s the same mistake I have seen SO MANY people make. However, it was the first (but certainly not the last) time I’d seen someone who called themselves a Facebook Ads Manager make this fatal ad mistake. This honestly made me so mad for her. Here she had hired someone who claimed to know what they were doing with Facebook Ads but they made a super basic mistake. Lesson #1 – Make sure you or your Facebook Ads Manager know what they’re doing. If you’re hiring someone, ask for previous results. Have they gotten results for a similar campaign before? This basic mistake? Becky’s ad person was running ads for the wrong Objective. Facebook’s algorithm is brilliant. Besides knowing more about you than your best friend does, it also know how we use Facebook. It knows who is the most likely to scroll. It know who is the most likely to click to a website. It know who is most likely to convert into a lead or a sale. In Step 1 of starting your ad campaign, you set your objective. 90% of your ad campaigns should have the same objective. Why? Because the majority of the time you’re looking for someone to convert into a lead or a sale. If your goal is to get someone to sign up for a lead magnet to get on your email list, and you run the ad for Traffic, Facebook’s algorithm will optimize your audience and show the ad to the people most likely to click to your webiste. But if you run the ad for Conversions, it will show the ad to the people in your audience most likely to convert into a lead. So, you end up getting a better cost per conversion, which ultiamtely saves you money and gives you a better ROI. In Becky’s case, it was even worse than running ads for Traffic. Her ad person was running the ads for Reach! Here’s why that is a HUGE no-no: Ads for Reach means that Facebook will show your ad to as many people in your audience as possible. Typically it costs about $35 to show your Reach ad to about 1,000 people. But this means it’s showing the ad to people who are not at all likely to take the desired action. In fact, the only time you’d want to run ads for Reach is if you have a warm, highly targeted audience of people who have already opted-in and you know that you want to reach them all in a very short period of of time. Lesson #2: Decide on the goal for your ads and use that goal to choose your Objective. 90% of the time, you’ll want to select Conversions. Please note: In order to run ads for conversions, you do need to have a Facebook pixel properly placed. Alright, so here’s the 3rd issue, her audience was way too big and not well targeted. If you’re targeting by country or larger, you want your audience size to be around 1 million. Becky’s audience? 44 times that. Her audience was around 44 million people and including targeting options like people interested in Oprah! Have you ever watched Oprah’s show or clicked on something related to Oprah on Facebook. My guess is yes. But that doesn’t tell me much about you and your interests. An interest in Oprah is way to vague because she is too big of a brand. The other issue is that her audience targeting was piled on top of each other. So you were targeted if you had an interest in Oprah OR Tony Robbins OR yoga. But Facebook has an amazing feature of layered targeting. So instead of saying I want to target people interested in A or B or C, you can say I want to target people interested in A and also interested in B or C but not interested in D.
Layering your targeting helps you narrow down your ideal client. So, a better option would have been an interest in Oprah AND Tony Robbins AND yoga. Lesson #3: If you’re targeting by country or larger, your audience size should be around 1 million. Be sure to use layered targeting to narrow down your audience. In Becky’s case, she signed on for strategy sessions with me and by making some simple changes she was able to start getting leads in her business through Facebook Ads for the first time ever! Are you ready to start bringing in leads for your business? Ready to run Facebook Ads that are effective? 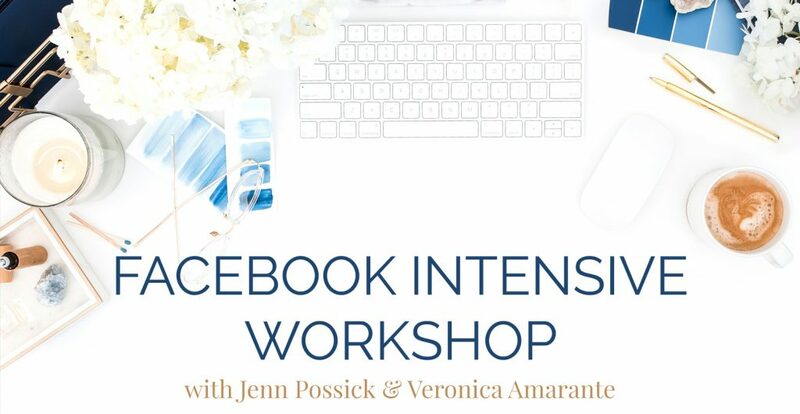 I’m sharing my 7-Figure Facebook Ads Framework (the same one I used to bring in over $2 million in sales for one of my clients) in a Facebook Intensive Workshop – a half-day workshop October 6th that I’m co-hosting with Veronica Amarante, live in St Pete, Florida and Online! We’ll be sharing oragnic and paid strategies to help you get more clients and stop wasting time and money on Facebook.